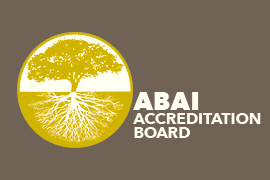 The Association for Behavior Analysis International (ABAI) Accreditation Board's mission is to establish and implement standards for the accreditation of educational programs in behavior analysis. Programs seeking initial accreditation or reaccreditation are required to verify eligibility and then submit a self-study report, which is a complete assessment of the program, led by program administrators and involving faculty, students, and external stakeholders. The self-study process provides an opportunity for the administration and faculty to examine the program in light of the ABAI Accreditation Board standards and policies and to draft recommendations to improve the program and services for students. The self-study report process allows an opportunity, once in an accreditation cycle, for the program to report on these assessment efforts and the current status of its accreditation compliance. The site visit team that evaluates the program will use the self-study report as its primary reference. The completed self-study report should be submitted as a zipped/compressed file to abaiaccreditation@abainternational.org. Applicants for initial accreditation may, at their option and expense, request a resource visit to assess their program’s readiness for accreditation and to provide consultation on the preparation of the self-study report. Results from these visits do not guarantee a favorable outcome from the ABAI Accreditation Board. Program administrators should direct inquires about resource visits to abaiaccreditation@abainternational.org.